Red Bull's Sebastian Vettel closed in on Fernando Alonso's championship lead by winning in Singapore on Sunday - closing the gap to 29 points - but I don't think the Spaniard needs to be too worried about it. Alonso is doing a good enough job to finish in the top three in every race, as he did in Singapore, and all he needs now is to maintain the consistency he and Ferrari have had all year. At the beginning of the year, during pre-season testing, everyone was asking who was going to win the championship, and no-one knew because they were not even sure about the potential of their own cars. But it was quite clear that we were heading into a season where everything was going to be so close, between team-mates and car performance, and the important part was going to be to maintain consistency and stay as close as you could to the top five positions in every race. The one who would make least mistakes and maintained that consistency of finishing would be the one who won the championship, and that is the case with Alonso so far. He has done great to score points so consistently, and he is still in a very strong position. The Red Bull does not look like the most reliable car - they have had a number of failures, including the alternator problems on Vettel's car in Valencia and Monza - and the same goes for the McLaren. But the Ferrari finishes all the races. It never breaks. Alonso's only retirement was caused by an accident at the start in Belgium for which he was completely blameless. Then they have Alonso, who is driving incredibly consistently, and never making mistakes. This is the best package. It doesn't have to be the best car or even perhaps the fastest driver. It just has to be the most consistent package between driver and car, and this is what Alonso and Ferrari are and it's what Red Bull and McLaren lack. That's why I think Alonso, if he finishes the races in the top five from now on, will definitely take the championship. Lewis Hamilton was in excellent form in Singapore and his gearbox failure cost him a certain victory. Hamilton was the man to beat all weekend. He was the favourite and he not only had the pace to win but also the best tyre wear. I saw his McLaren's tyres on Friday afternoon, after the teams had done their race-simulation runs in second practice, and he looked in the best shape by far. Not only was he the fastest both on the lower-fuel run and the high-fuel run, but he also had very good tyre degradation. In fact, I was thinking they would be the only team and driver out of the whole grid who would be able to do just two pit stops. Hamilton was very confident in his car's set-up from the beginning. He had great traction out of the slow-speed corners, and I could see the balance of the car was almost perfect throughout the weekend, while his team-mate Jenson Button was struggling a little bit more with the rear end. They were looking really good, and I still believe McLaren has the fastest package on the grid. 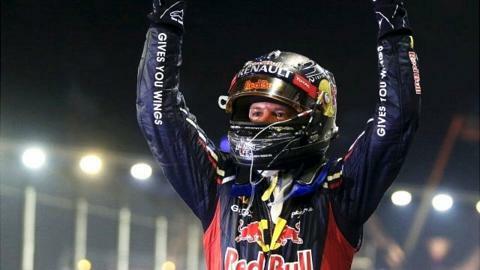 Red Bull looked good in Singapore - Vettel was the closest to Hamilton - but I suspect that was a bit of a one-off. I don't believe they can have closed the gap to the McLaren that was obvious in the previous four races; it was down to the characteristics of the Singapore track suiting the Red Bull car. The integration of the Red Bull's exhaust system, rear aerodynamics and engine control system is very well suited to that sort of slow track, with short, tight corners. The Red Bull always runs with high downforce and short gearing, and they don't have great top speed, so Singapore is a perfect track for them because it is just cornering and slow speed - like Monaco and Valencia, where they were also very competitive. I don't think Red Bull will be as competitive at the next two races in Japan and Korea as they were in Singapore. I think they can be at the level of Fernando Alonso's Ferrari, more or less, but the McLarens are a step ahead. In Japan, Hamilton will be the favourite for the win and for pole position, and then we will see what happens - there are still six races to go. Michael Schumacher was given a 10-place grid penalty for the Japanese Grand Prix after smashing into the back of Toro Rosso's Jean-Eric Vergne. In my view, it was completely the right decision to punish him for that incident. I'm sure Michael will be concerned about what happened and that he agrees he deserved the penalty. I have been really enjoying my commentary role at BBC Radio 5 live this year but I won't be going to the next three races. It had been planned for some time. It's better for me to prepare for next year, to keep my training up, as I'm sure I will be back driving in F1. I also have an important test with Pirelli in Paul Ricard, France, in two weeks' time, where we are going to be deciding on the specification of next year's wet tyres. Apart from that I will dedicate myself to training. I will be back with the BBC for the final two races of the year in the USA and Brazil. You might be interested in a little film I have been involved in, supporting my favourite football team Espanyol. They are the second team of the city of Barcelona. They have a new strip this season, and some of the celebrities who support the team have been involved in a promotional film about it. There is an athlete, a swimmer, a winter Olympian and myself. I thought it was a nice film and I posted a link to it on my Twitter account.You can also watch the film here. You might wonder how I'm from Barcelona and ended up supporting the 'little' team, when Barcelona are much more successful. I have big respect for Barcelona and all the players there. They are incredibly talented and it is probably the best football club in the world. But my passion for Espanyol started because they were playing in the first football match I watched, with my dad. So they became my team. I always felt very associated with them. They were always struggling for budget, fighting to succeed, to stay in the Primera Liga, and I just fell in love. That's how it is with football sometimes. Jaime Alguersuari, BBC 5 live's F1 analyst, drove for Toro Rosso in F1 from 2009-11. He was talking to BBC Sport's Andrew Benson.